It's been awhile since I've dug through the scrap boxes on a Sunday. 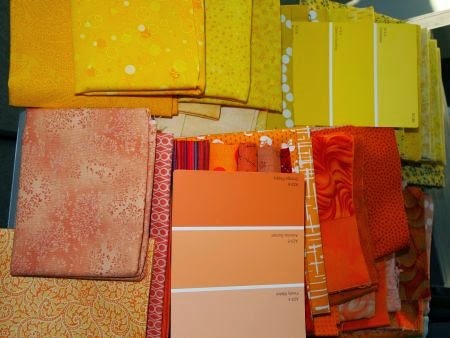 Thanks to Bonnie Hunter of Quiltville, I spent an enjoyable afternoon digging through my scraps today looking for fabrics for Bonnie's next mystery quilt! Each autumn, Bonnie hosts a Mystery QAL on her blog. I swore to myself I wouldn't start this year's scrappy mystery, as I have yet to complete last year's "Easy Street." Not surprisingly, I had enough of the blues and greens that I didn't need to buy any extra. Bonnie recommends "shirtings" for the background. Hooray, I will have to shop for more of those! Linking up to Kim's Big Quilting Adventure Scrap Basket Sunday. The first clue for Celtic Solstice goes "live" on Friday, November 29. Good thing I don't shop that day, because I'll be busy cutting and sewing my "Celtic Solstice!" 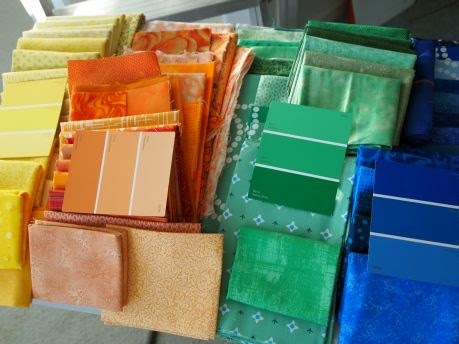 Gotta love those paint chips! Bonnie Hunter's mysteries are spectator sports for me; I'll be watching. I sure can see how the colors tempted you. Oh I am doing her quilt too! I have never joined in on one before so looking forward to it. 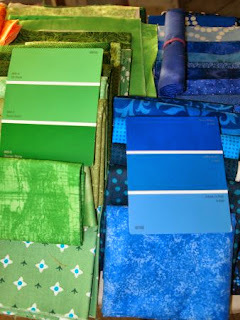 Having a little difficulty picking my fabrics so was happy to see some of your picks. Think it may help me decide. I love following your blog! Thanks, Linda -- I am trying to finish my "Easy Street" from last year before I begin this one!